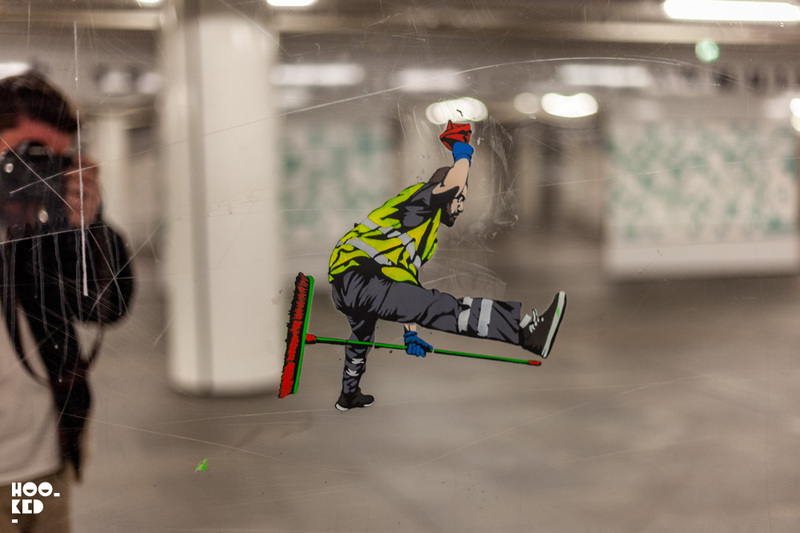 The two street artists, Jaune with his miniature stencil based works and Pol Cosmo with his wheat-pasted posters had both installed multiple interventions across the city as part of the first edition of The Crystal Ship, a contemporary street art festival curated by Bjorn Van Pouke. 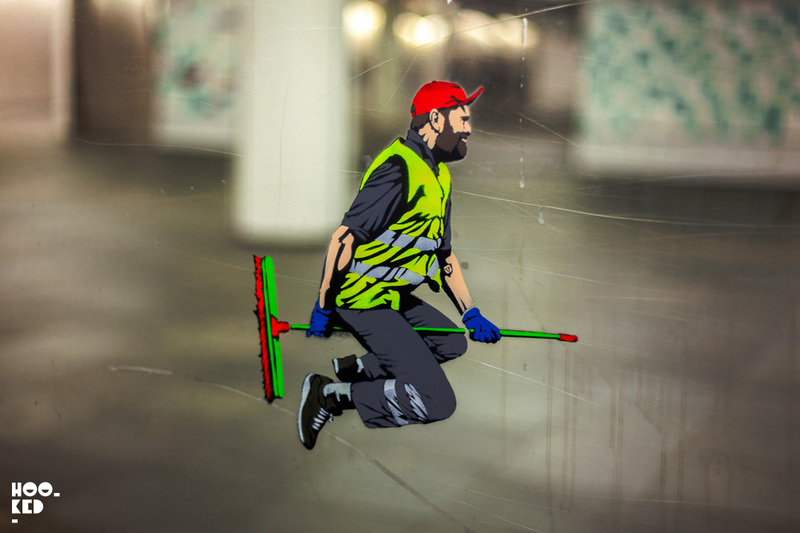 Both artists were among some of the local artists joining the international line up of street artists who were invited to install works across the city as part of the festival. 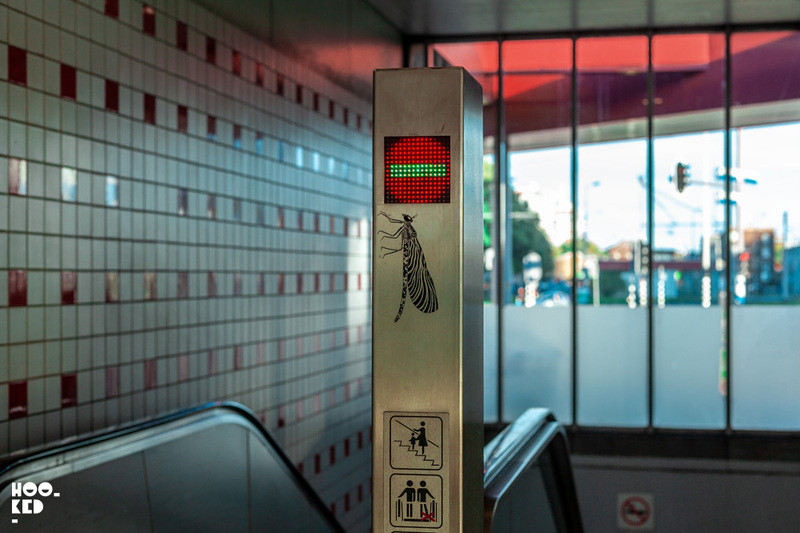 A call out to local Ostend residents was made ahead of the festival opening, inviting them to offer up the exterior walls and doorways of their homes for the two artists to work upon. This callout saw a huge number of residents offering up spaces resulting in a waiting list for both Jaune and Pol Cosmo who had more spaces offered than they had time to complete. Since our first introduction to their work, we have caught up with both artists on a number of occasions, following their work and progress. Pol Cosmo has begun scaling up his paper works and we got to see a selection of these larger creatures on some of the walls on a visit to the Belgian city of Ghent. 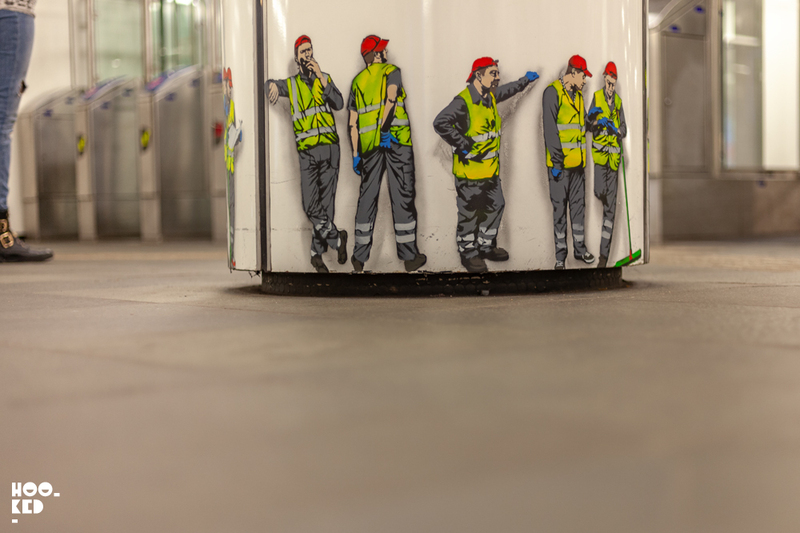 Jaune has also been making waves in the street art world and following the Ostend Festival we caught up with him in Stavanger Norway for the Nuart Festival and again a few months later at the Scottish edition NuArt Aberdeen. 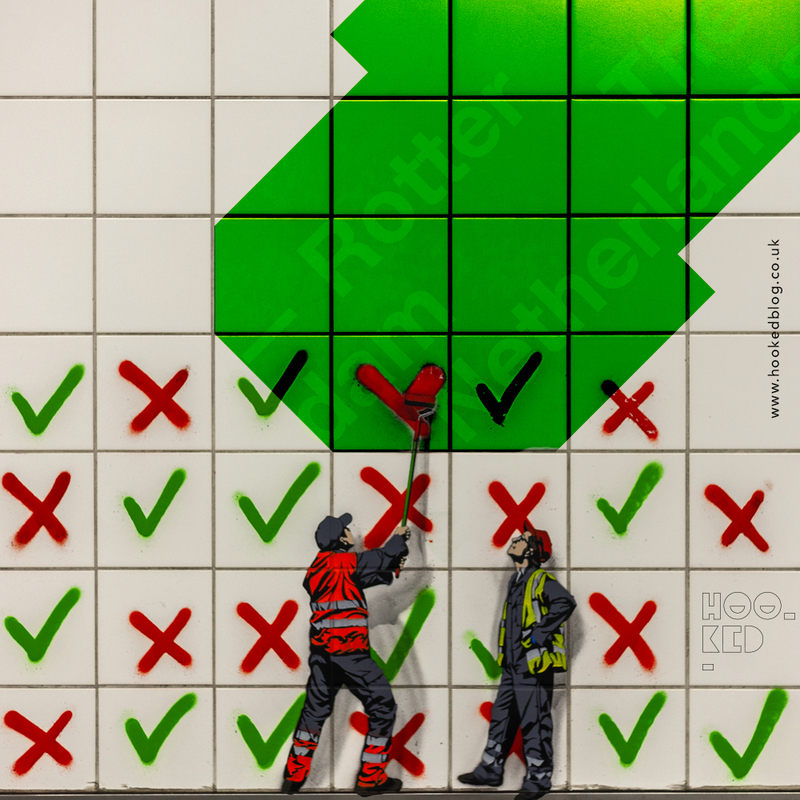 He has also had a number of solo shows his most recent in Amsterdam at the Vroom and Gallery. And after a long wait, we finally got to see a UK visit with Jaune hitting up the streets of East London when he was in town for the London edition of the Moniker Art Fair held on Brick Lane at the Old Truman Brewery. In September Hookedblog were on the road travelling and as is usually the case we took far too many photographs that we never seem to have enough time to upload and share on the blog. While we were in Sicily at the Ragusa festival we changed our flights, making a detour to Rotterdam via Rome for a quick stop over and onwards to Amsterdam. 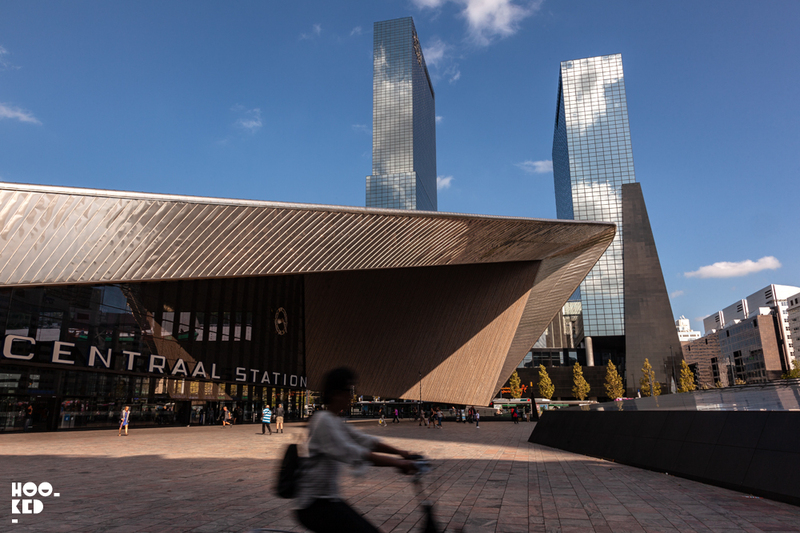 A quick train from Amsterdam’s Schiphol Airport and we were pulling into the impressive looking Central Station in Rotterdam. So why the detour you might be wondering and why Rotterdam? We had heard that Rotterdam was hosting the very first European edition of the international PowWow Street art festival and as we had yet to attend an edition of PowWow it made sense to us to make our way to the city for this edition. It was also an opportunity for us to make our first visit to Rotterdam, a city we had heard positive things about. The PowWow brand and festival has grown into a globally recognised event within the street art and graffiti communities. After several successful editions on the outskirts of Hawaii, the festival spread to locations in Los Angeles, Taiwan, Hong Kong and Japan and it was a big scoop for the city of Rotterdam to be selected to host very first European edition of Pow Wow. Taking a short 10-minute tram ride from Central station, we dropped our bags off at City Hub Hotel Rotterdam on Witte de Withstraat. With a quick and easy self-checking system at the hotel, we dropped off our bags and hit the streets with our camera. The main PowWow Rotterdam festival site was just outside the city centre at Keilewerf 1 and 2, a former industrial part of the city next to the Marconiplein underground station. 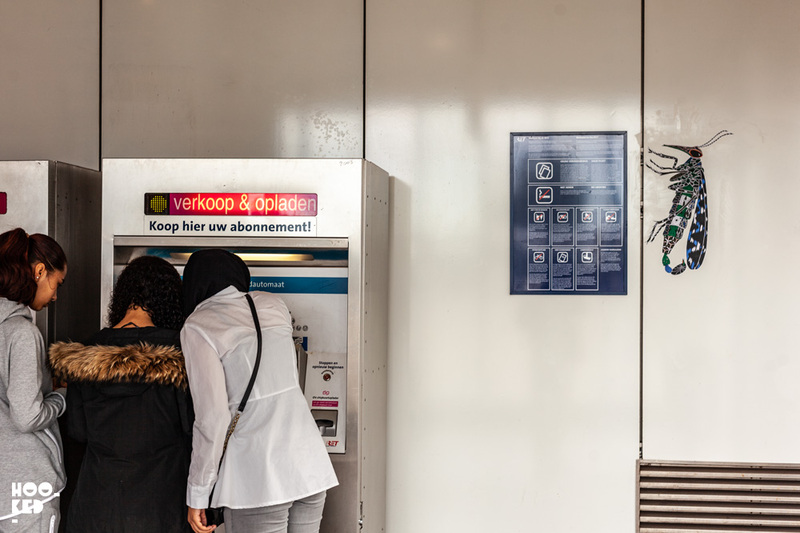 Alongside the line up of artists painting murals as part of the festival, artists Jaune and PoL Cosmo were invited to take over two subways stations as part of PowWow Rotterdam. 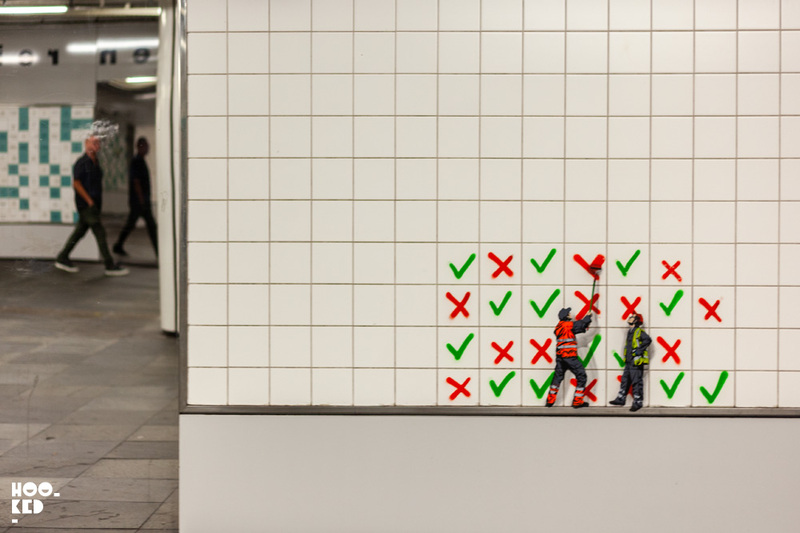 Both introduced their works onto station platforms and in and around the station's ticket offices of Eendrachtsplein station to Marconiplein station. 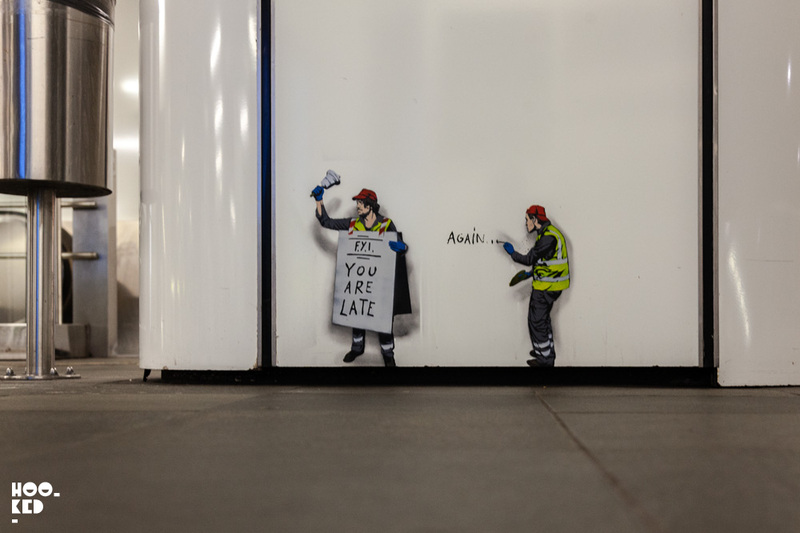 Impressive to see the city and the subway network allowing two street artists to introduce their work into the two stations along the route to the Pow Wow Rotterdam festival site, something we could never imagine new happening on the underground nextwork here in London. 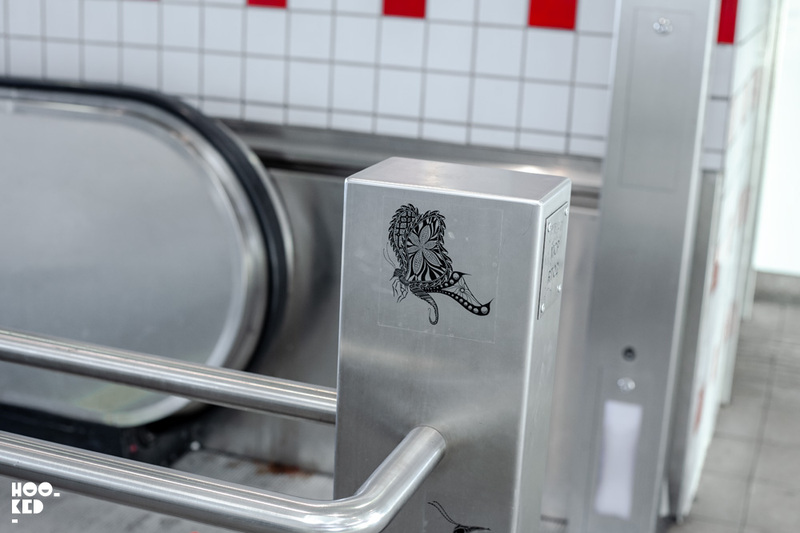 Over the three days, we were in town travelling back and forth to the festival site we continued to discover more of the artist's works in the two underground stations. 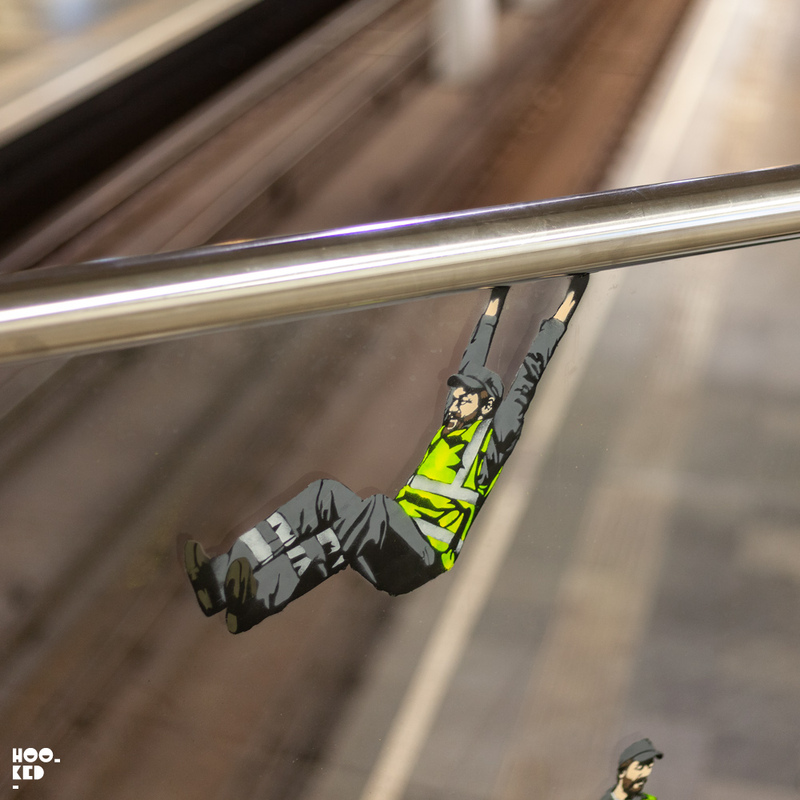 Just when we thought we had photographed them all we would spot anther Jaune on a panel of glass with his sanitation workers swinging out of the handrails or we would find yourself on the other end of the platform and spot another Pol Cosmo paper creature pasted onto the site of a dustbin on the platform. Pictured in the post is the collection of images we found over the three days, we are unsure if we managed to capture them all but the large selection we did find is shared here. 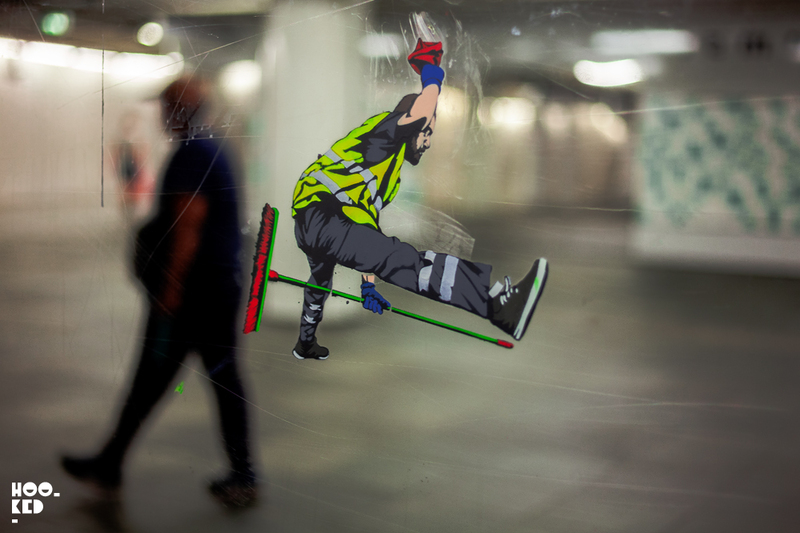 Belgian street artist Jaune's stencilled character painted on the mirror surface of the station entrance. 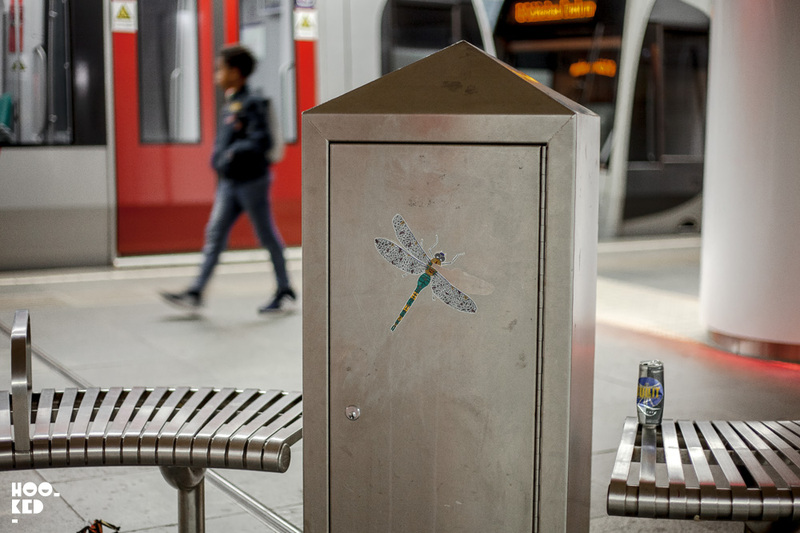 Belgian street artists Pol Cosmos paper insects were pastes right throughout the two underground stations. Say tuned, we will post a collection of some of the other Rotterdam street art photos we shot in another post, plus we still have lots of photos from PowWow Rotterdam we have yet to share on the blog. Those of you following us on the Hookedblog Instagram account will already have seen a selection of our Pow Wow Rotterdam images. 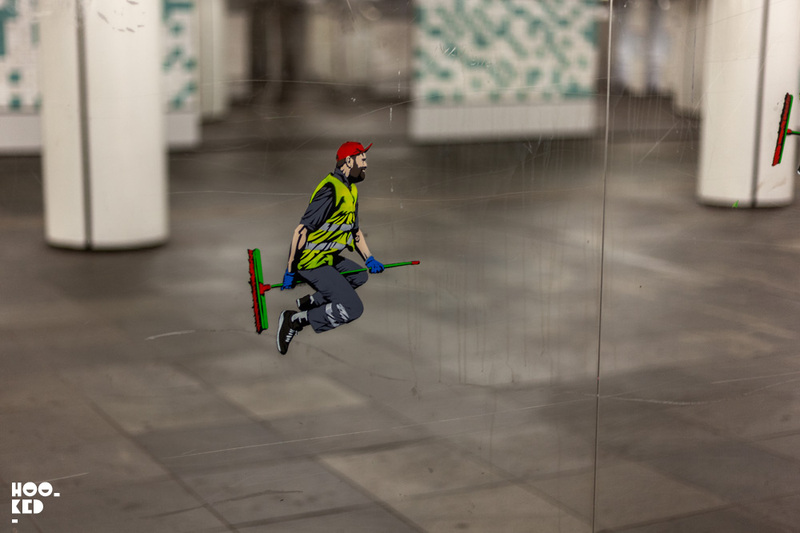 Street Artist Pol Cosmo's Insects are taking over the streets. Why not stay up to date with Hookedblog's latest posts by email and subscribe to the Hookedblog mailing list.